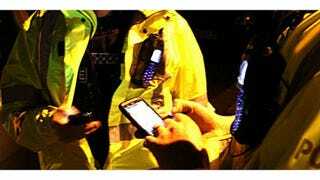 In news that's almost too much of a walking stereotype to be true, Scotland's Tayside Police force gave 80 officers donated smartphones with social media to communicate with civilians, and instead, one used it to tweet news about his doughnut consumption. No! It is too good! Or, too bad, if you're thinking about the whole "improving public relations with the police department" angle. The cops received training in how to properly use these sites, along with an app built specifically for them. The idea behind the initiative to allow residents a chance to follow the police through the app to see exactly what officers are dealing with and where they'd been active, using the geolocation data in tweets. The force also hopes to let citizens interact with cops directly to know more about efforts in their area. Aside from fried dough shenanigans, the program has received criticism for distracting officers from following their beats in favor of dreaming up of witty tweets. Isn't that the price everyone with a Twitter account pays? Brevity in hilariousness is a heavy burden, as these cops are coming to find out. However, Sarah Craig, Tayside Police force's head of digital media and communications, says their experience with the social medial platforms has been, "hugely positive." It's actually a pretty cool idea, and one that the Seattle police department is experimenting with, as well. Here's an thought - seeing as many politicians use Twitter and Facebook to regularly communicate with their constituents, why don't we fly Newark, NJ mayor/my future lover and friend, Cory Booker, out there to show them how it's done?